When we think of sight fishing, we often think of spotting largemouth hovering over a bed or bonefish nosing their way over sand flats in gin-clear water. When it comes to panfish and springtime attempts to catch a mess for a fish fry, sight fishing can take on many non-typical forms; some of which don’t involve actually seeing the fish you’re targeting. Of course, when the big bluegills are bedding and the lake bottom takes on the dimpled texture of an oversized golf ball due to all of the nests, it’s easy to targets. But what about crappie and bluegill in stained or tannic water? Having spent a fair amount of time in my youth sight fishing for bass and just about any fish I could lay eyes on, I’ve come to realize the pursuit is all about what you can’t see. This may seem strange, but think about crappie for a second. We know they love timber and if they can’t find it, they’ll orient themselves to any sort of vertical structure they can find. Naturally, there are situations where they’ll suspend over nothing, but during the spring when they are running shallow and looking to spawn, they’ll hold tight to cover of some sort. Putting on polarized sunglasses and looking for the right cover is often the key. Sometimes you’ll spot the actual fish, but often times it’s simply a hole in the emergent vegetation, or a cluster of lilypad rootwads. For slabs in the spring, it’s almost always necessary to see where they should be and then try to find out. 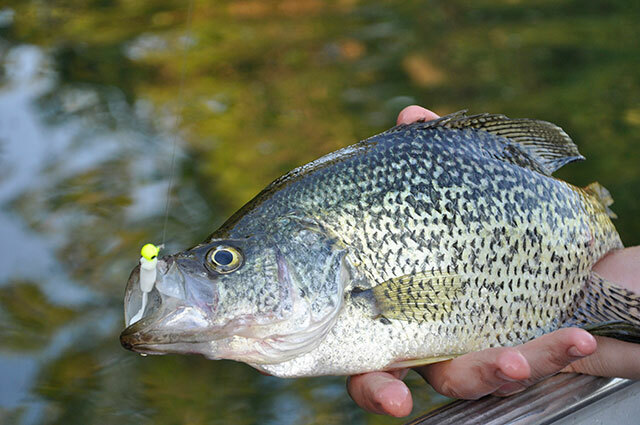 Read the rest of “Sight-Fishing Tips for Crappie and Panfish” at TheSportsmanChannel.com.